Just past the storage tanks at Leith Harbour, this lone Eurasian Reindeer grazed. His horns were still growing and covered in "velvet". 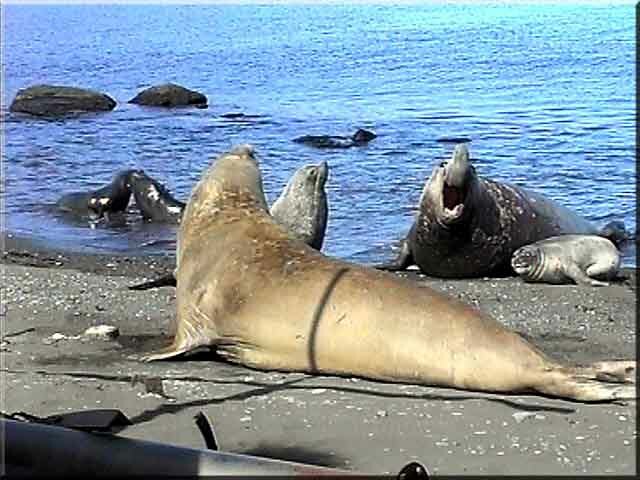 The shoreline is the Elephant Seal's home ground as the males keep a keen eye on the competition. Two harem-less bulls decide to take their tempers out on each other. 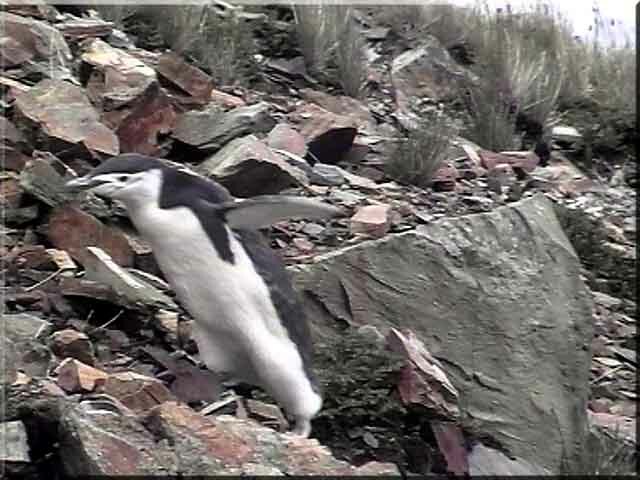 A couple of Gentoo Penguins take a walk by a stream and a Chinstrap Penguin climbs the rocks close by. Fur Seals in Leith Harbour, where a bull poses and youngsters play. There is also a Snowy Sheathbill and a one-legged Blue-eyed Cormorant. 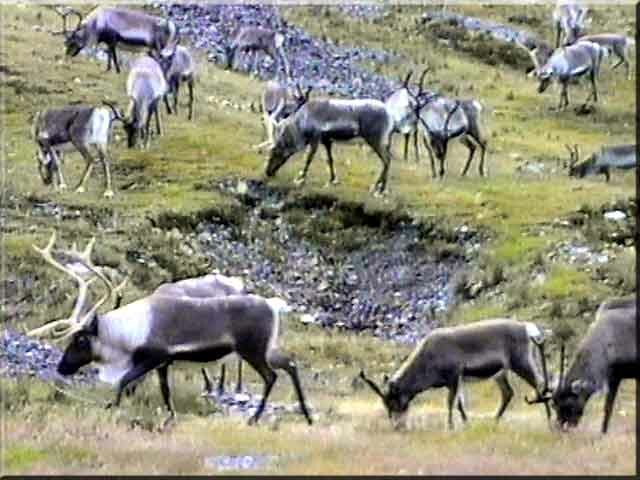 Eurasian Reindeer were introduced to South Georgia to give the men fresh meat, and some "sport". There were three introductions in 1911, 1912, and 1925. One herd died out, leaving two geographically separate herds. In 1995 there were reckoned to be around 4,000 deer on South Georgia. When whaling ended their numbers were unchecked, and their presence was causing environmental damage. In 2011 it was decided to eradicate the reindeer, and a cull commenced. Their numbers had been underestimated and just under 7,000 animals were culled. A Eurasian Reindeer at Leith Harbour. This chap was among a small herd that were sitting on a patch of snow near the old cinema. 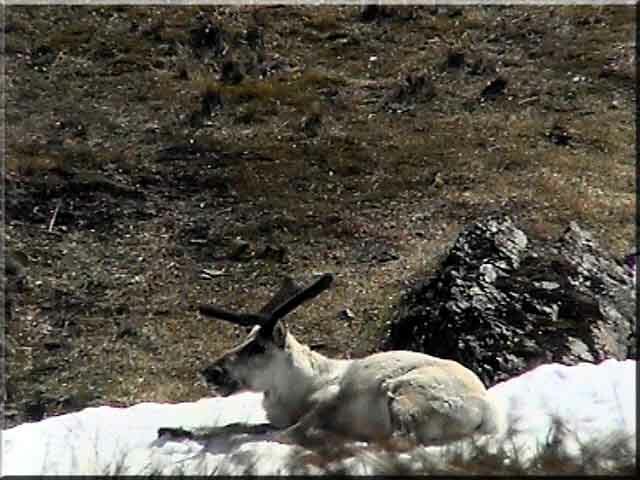 All the other snow had melted as can be seen in the background, but the reindeer were all sitting in the snowy patch. 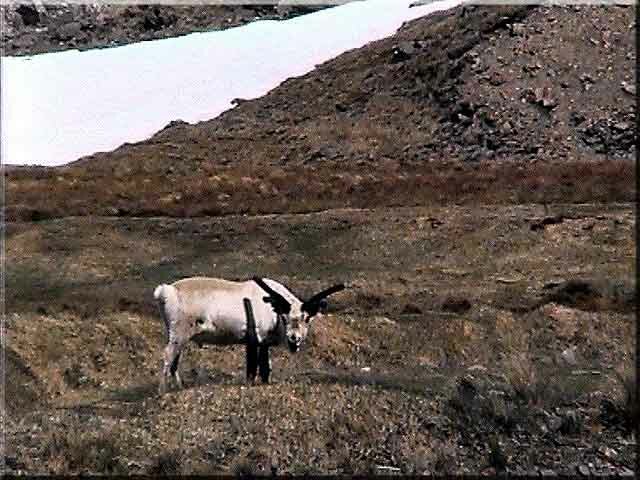 The antlers of this animal were still covered in "velvet" and had a lot more growing to do. The herd later in the season with the leader in the lower left of the picture. He has a good spread of antlers and a long white beard. The Eurasian Reindeer are the only deer where both males and females bear antlers. 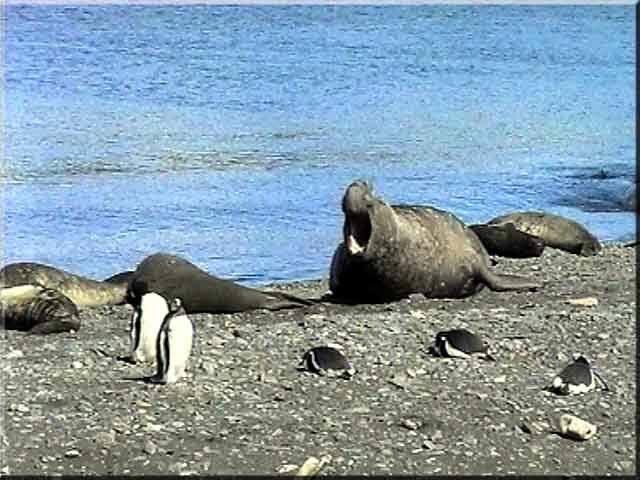 A bull Elephant Seal at Leith Harbour with his harem and a few Gentoo Penguins. He has noticed another male attempting to invade his territory. 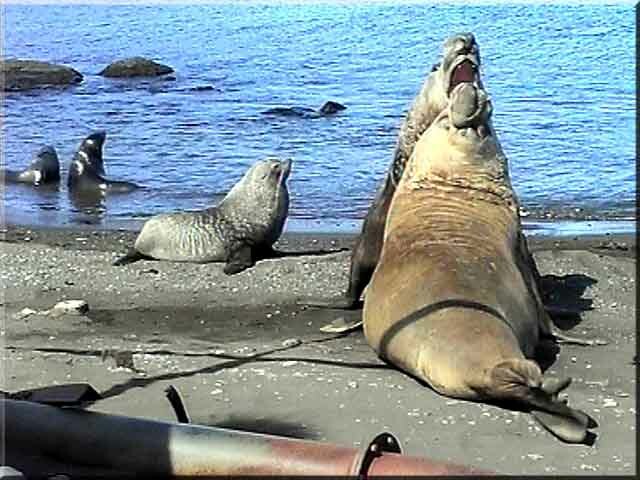 Two bull Elephant Seals prepare to face up to each other. 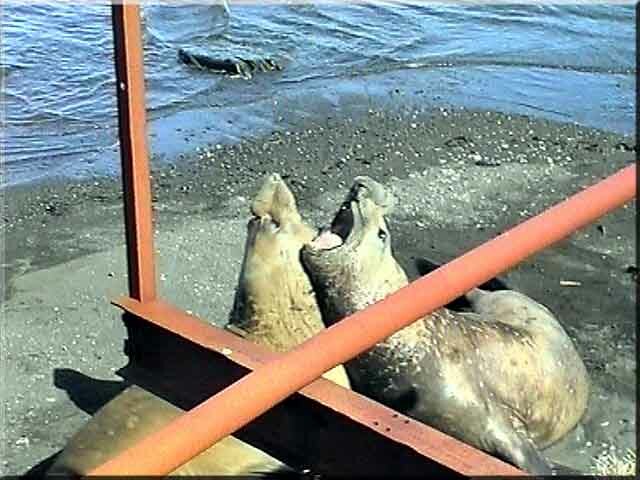 It looks as if the bull Fur Seal in between them is going to act as a referee. Two bulls in their most threatening stance. There were no females involved in this scuffle as they had both been beaten by a larger bull further along the beach. This was more ill humour than anything else and the unwillingness to share the same stretch of sand. The same two bulls later on and a bit further down the beach. They had decided to have another brief coming to blows. 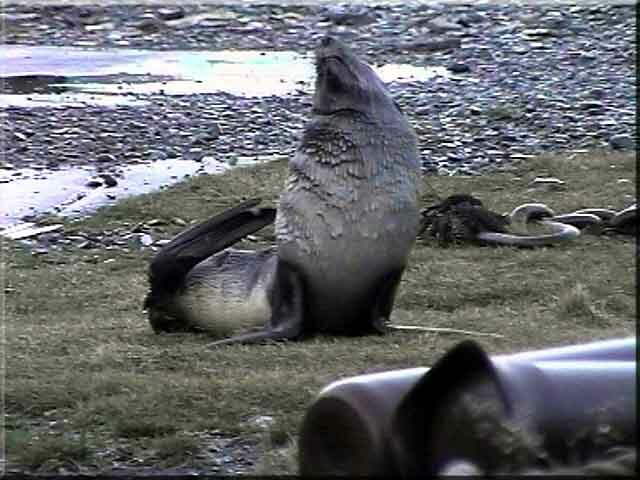 This bull Fur Seal was quite happy to pose for the video camera. He scratched and stretched and yawned for ten minutes or so. When I put the camera back into the bag he went wild and started to chase me through the streets. 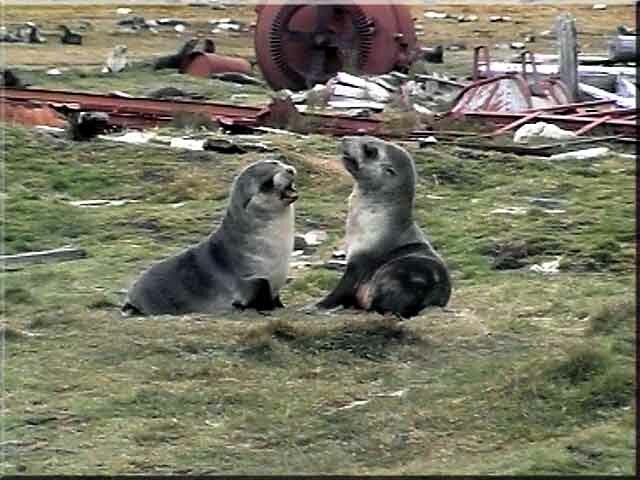 Young Fur Seals play and have fun in the scrap area just outside the whaling station. 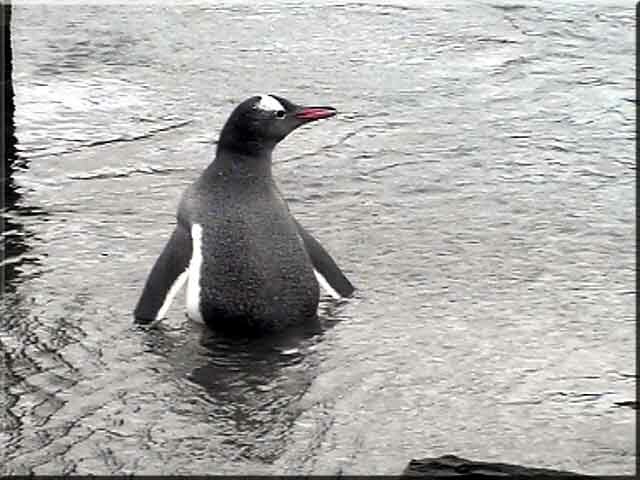 A Gentoo Penguin takes a walk in the stream that runs from the reservoir dam at the back of Leith Harbour. 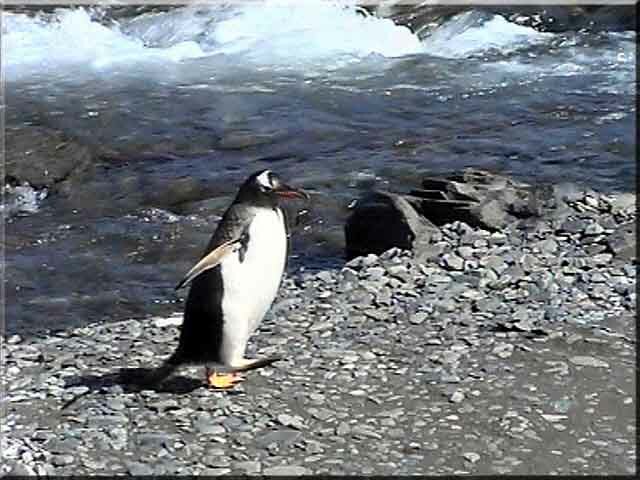 Another Gentoo walking past where the stream meets the sea. It is easy to see from this picture where the name "Chinstrap" originates from. I was sitting beside the stream that runs down from the reservoir dam watching this little chap as he decided which way to get up the hill. 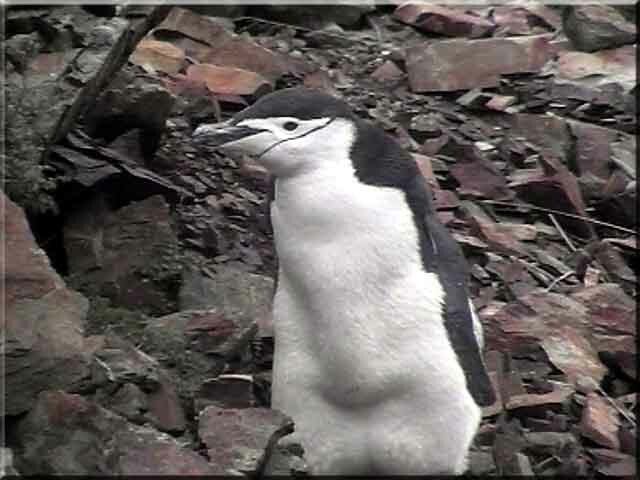 There was a lot of loose scree and with his little legs it could not have been easy. We were in each other's company for around twenty minutes and he was certainly in no rush to get to his destination. He would sit for a while and every now and then he would climb for a few moments, then take a long rest. Here he is setting off again. 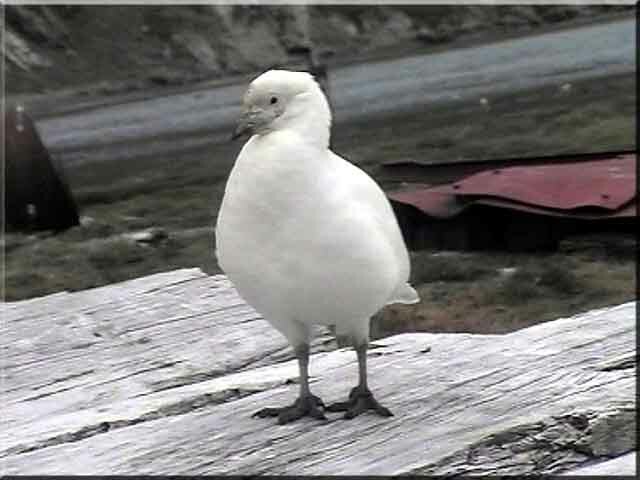 The notorious Snowy Sheathbill. Sentenced to spend it's life eating penguin faeces or regurgitated food, it is perhaps little wonder that it has a warped sense of humour. They will also eat rotting flesh or blubber. I have a bit of a soft spot for this little, natural comedian. The Blue-eyed Cormorant. 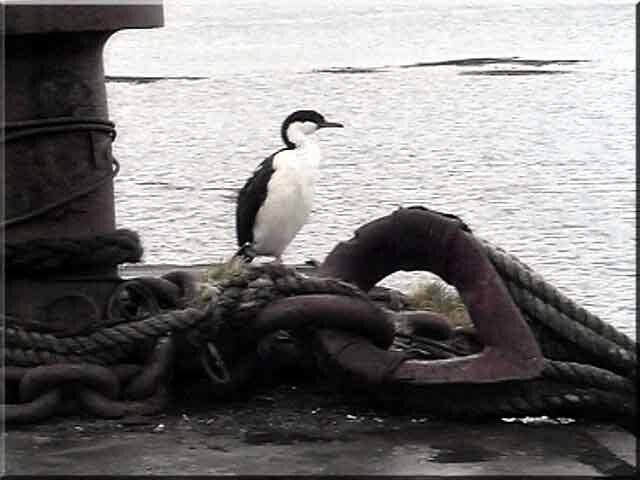 This little fellow sitting at the end of the concrete jetty at Leith Harbour looked as if there was something not quite right with it. After a while I noticed that it's right leg was missing completely! It did not appear to be perturbed by the lack of a limb and otherwise seemed perfectly healthy.